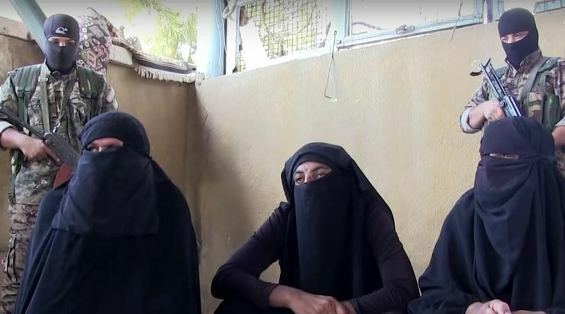 Islamic State fighters disguised as women were reportedly caught by opposition forces while attempting to flee Manbij, Syria. The men, dressed in full black veils, attempted to blend in with civilians fleeing the northern city, after coalition forces issued an order to leave Manbij within two days. Footage of the three men was published online by the US-backed Syrian Democratic Forces (SDF) on Thursday, which consists of predominantly Kurdish fighter. The video shows the men sitting in front of the opposition fighters, with their faces still covered. They are then shown walking with their face veils removed, and eventually stripping down to their underwear. One of the captured fighters said he was a sniper, according to Storyful news verification service, as cited by Middle East Eye. The attempted escape came after the Manbij Military Council (MMC) – part of the SDF - gave IS fighters 48 hours to leave the strategic town with their “individual weapons” on Thursday, saying that was their last chance to leave alive.